Clark College Dental Hygiene Program graduates earn a Bachelor of Applied Science in Dental Hygiene Degree. Our dedicated faculty members and staff are focused on student success. The Dental Hygiene program provides classroom and clinical experiences that successfully prepare students for the national board exam and various clinical licensing exams. 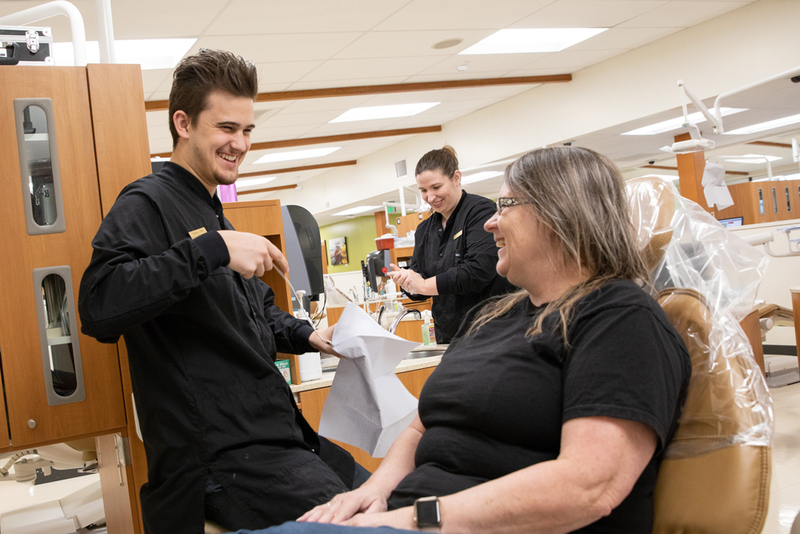 Students serve the community by participating in oral health programs in area schools and caring for patients at the Free Clinic of Southwest Washington and other local facilities serving the community. We welcome you to visit our state-of-the-art clinic where a friendly, learner-centered environment is maintained. The clinic fills 3,200 appointments for 2,000 patients annually. New patient screening appointments are available on Friday mornings. The Clark College Dental Hygiene Program has state-of-the-art facilities with a 30-chair clinic, radiology suite, and a simulation lab with 15 units. The dental hygiene clinic serves area counties providing a diverse patient population. Students are mentored by 5 full-time and 10 part-time faculty members as well as supervising dentists from the community. Students also treat patients at off-campus sites in both Washington and Oregon. Dental hygienists are licensed health care professionals who provide preventive, educational, and therapeutic dental health services directly to patients. They focus on preventing and treating dental diseases to improve oral health in support of the patient's overall health. Dental hygienists must be licensed in each state in which they practice. Licensure requirements vary from state to state. In most states, candidates must graduate from an accredited dental hygiene program, pass a national written board examination, and pass a state or regional clinical board examiniation. The RDH credential stands for Registered Dental Hygienist and indicates that the dental hygienist is licensed to practice. The scope of practice for dental hygienists varies from state to state. Most dental hygienist perform oral health assessments; expose, process, and interpret dental radiographs (x-rays); remove plaque, tartar, and stain from the teeth; apply preventive materials including fluoride and sealants; teach patients proper oral hygiene techniques; and counsel patients on maintaining optimal oral health. In some states, dental hygienists can administer local anesthesia and nitrous oxide sedation; prescribe fluoride and antimicrobial agents; and place temporary and permanent restorations. Clinical dental hygienists provide direct patient care in a variety of health care settings which include private dental offices, managed care organizations, schools, public health clinics, hospitals, and long-term care facilities. Dental hygienists with a bachelor's or master's degree have additional career options which include teaching dental assisting, dental hygiene and dental students in colleges and universities; administering public health and community-based programs; managing dental practices and health care facilities; and marketing dental supplies, products, and equipment. According to the 2014-2024 job outlook, employment for a dental hygienist is expected to increase by 19%, which according to the Bureau of Labor Statistics Occupational Outlook Handbook is much faster than average. Licensed dental hygienists in this region can find employment in a variety of settings including private practice dental offices, clinics, public health settings, educational institutions, and private businesses. Salary range for a dental hygienist in Washington has an average wage of $43.34 per hour and annual average wage of $90,150. Occupational Employment and Wages can be found on the Bureau of Labor Statistics website. Are you considering applying to the Clark College Dental Hygiene Program? If so, it is important to understand the requirements of both the program and the profession. Dental hygiene is a physically demanding career that requires hand-eye coordination and fine motor skills. The program requires a 40 hours-per-week commitment from students for classes and clinical rotations. Clinical assignments may be offered at times other than traditional clinical hours, such as evenings (other than Monday-Friday, 5:00am-7:00pm) and/or weekends. Reliable transportation is important. Program applications are due January 8 each year. Each cohort starts in the fall quarter (September). Each cohort includes 25 students.